As Volunteers In Service To America, VISTA members work full-time for a year in communities throughout the United States to advance local solutions, build capacity, and achieve sustainability. This service year is from August 5th, 2019 – August 3rd, 2020. Applications are accepted on a rolling basis, so apply early! The last day applications will be accepted is May 15, 2019. To apply to be a High Point University AmeriCorps VISTA focusing on Education click here! To apply to work on Food Security click here! 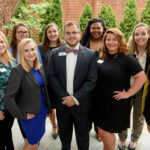 High Point University (HPU) began hosting eight VISTAs and a VISTA leader in July 2017 to improve education and food security in High Point. The HPU VISTAs are committed to making a difference on and off campus in the efforts to alleviate poverty and fight food insecurities. Benefits of being a VISTA at HPU include living in an HPU maintained house, a 19 meal dining plan during the academic year, conference travel support, limited health benefits, a $13,800 living allowance, and at the end of the year VISTAs have the option of a Segal Education Award ($6,095) or a post-service stipend ($1,800). Four VISTAs will work on education and four of the VISTAs will work on food security in the High Point community. Develop marketing and fundraising materials for a Title I elementary school. Recruit mentors and tutors for Title I elementary school students. Engage community leaders to increase pride in a Title I elementary school. Oversee the progress of after-school programs for elementary & middle school students. Create a team of 30 HPU students who will mentor and advise high school students who would be the first in their families to go to college. Increase the engagement of HPU students in the local community. Promote and develop community gardens throughout High Point. Expand the farmers market options in the city. Ensure 14 permanent farmers market stands in downtown High Point are well used. Develop a co-op or business to increase healthy food in one of High Point’s food deserts. Improve food education in High Point by marketing healthy food options, developing nutrition and cooking classes, and aiding neighborhoods in promoting healthier food options for their residents. Expand HPU’s food recovery efforts. This project will offer VISTAs the chance to build upon other VISTAs work as well as start something new. They will get to envision a project from the ground up, build community ownership, engage volunteers, and see their idea utilized. After finishing the project year, VISTAs will be well-prepared for the job market or graduate school. They will have clear “wins,” tangible examples of their leadership, and strong references who are ready to speak to the impact that they have made. This project is perfect for someone wanting to get involved in education, health professions, community development, non-profit management, public administration, politics, or communications.